Kids love this as much as grown-ups! You can even use the leftovers for lunch the next day. In a large skillet, cook beef and onion over medium heat until meat is no longer pink. Drain. To the cooked beef and onion, add salsa, ketchup, chili powder, and salt. Heat through. Cut each tortilla into a 4” square; set scraps aside. Microwave eight squares at a time for 20 seconds. While warm and pliable press into the bottom and up the sides of greased muffin cups. Set aside. Cut tortilla scraps into stars with a 1” cookie cutter; place on greased baking sheet. Bake at 350 degrees for 6 minutes or until golden brown. Sprinkle with salt and set aside. 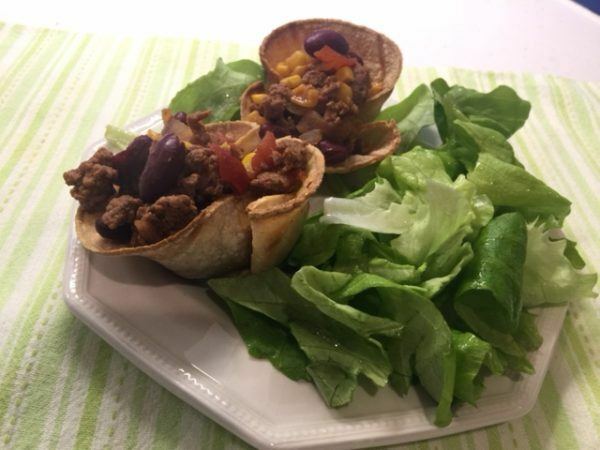 Fill each tortilla cup with 2 Tbsp meat mixture. Bake 12-15 minutes longer or until tortillas are golden brown. Serve with toppings of your choice; garnish with toasted stars.